Attention, deal hunters and holiday shoppers: You gotta check out The Bargainist for sales and coupons. I say this with a smile, since earlier today I redeemed my free drink coupon for a coffee at Seattle's Best and used a 20% off coupon at Borders to buy a present. Cha-ching! Speaking of bargains, my cousin Tony convinced me to check the circulars and brave the crowds on Black Friday. So I off marched to Circuit City and bought a GPS I spied for 50% off the regular price. 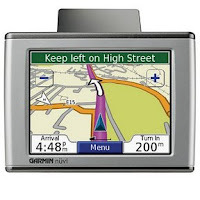 It's a Garmin Nuvi 350, portable and easy to use. Now my friend Kim (who is the queen of bargain hunting) has spotted the Garmin Nuvi 650 at Costco for $300 after a $150 rebate. If you know how directionally challenged I am (like the time I accidentally drove through the state of Pennsylvania and ended up in Maryland instead of NJ), then you know this purchase was well worth every penny.